Businesses are increasing their digital presence and engaging with customers online more than ever before. As a result, collecting and drawing insights from personal data is a new, burgeoning career in the tech industry and beyond. Though the role of the data scientist barely existed five years ago, it’s now one of the most in-demand jobs in all of tech. Data science jobs were among the fastest-growing careers in 2017. But considering the relative newness of the field, there’s undoubtedly an issue of supply and demand for quality candidates. As a result, data scientist salaries can easily swell into the six figures, with top companies paying well over $200,000 for the right talent. Which is why the Paysa team put together this post that walks you through what to expect from the average data scientist interview process, including 20 common questions you might come across when interviewing with top tech companies. If you have the data scientist title on your resume, chances are good you’re hearing from recruiters on a pretty regular basis. Talent acquisition leaders are eager to speak with as many qualified candidates as possible, but beware: they aren’t just letting anyone through to the hiring manager. While an interview with a recruiter might feel like your easiest interview, it’s an important stage where you’re making a first impression and gaining an ally that can help guide you throughout the rest of the process. 1.) What makes you interested in a career with our company? There are few things more awkward than not having a proper response to this question. Even if the recruiter contacted you (which let’s be honest, if you’re a data scientist, they probably did), you should still do your research and have an idea of why you might see yourself working there. Are you passionate about their mission? Intrigued by their innovation? Just a big fan of their product? Let the recruiter know—it helps build rapport and shows you’re serious about considering a job with the company. 2.) What are your salary expectations? Some people hesitate to offer up salary information early-on in an interview process because they don’t want to undervalue themselves. But with data scientist salaries all over the map, it’s important to be transparent about how you’re paid currently and what incentives you’d need to see in order to consider making a move. With so many great data scientist jobs available, that transparency ensures you’re not wasting your time on an opportunity that isn’t a fit for you. 3.) What are some of the big projects you’ve worked on in the last year? However, you’ll likely see this question rise up again later on in the interview process—perhaps even a few more times—and your answer may change dramatically based on your audience. For example, in a panel interview, you should take a more narrative-driven approach to this question. Your audience will want to evaluate what you accomplished, but also your understanding of how that accomplishment fits into the bigger picture for your current company. In a technical interview, you might take a more scientific approach to the question where you answer with more detail and specification about the procedural side of your biggest projects. 4.) What are your short and long-term career goals? If you get this question during an initial phone interview, you know you’re speaking with a good recruiter. The question tells the recruiter about your plans for the future, which they can quickly use to evaluate whether there’s potential for a long-term relationship between you and their company. The truth here benefits you both: if the company isn’t a good fit, neither side needs to waste time with a job that doesn’t serve your long-term goals. If you make it past the first round with the recruiter, congratulations—you’re well on your way to landing one of the most desirable jobs in all of tech. With average data scientist salaries hovering around $100,000 per year around the country, there’s great money and ample opportunity for career growth. Cultural. Questions to make sure you’re a fit for their team and organization. Experiential. Questions to better understand your skill level and what you’ve already accomplished in your career. Technical. Questions to assess your fundamental understanding of core concepts related to data science. The Paysa team has broken the panel interview questions down into these three categories, starting with cultural questions. 5.) Which data scientists do you admire the most and why? There’s certainly no right answer to this question, but that doesn’t make your response any less important. First of all, the question reveals how in-tune you are with the goings-on within your profession. Staying up on industry trends—particularly in a new, faster-growing field like data science—is an important trait most companies want to see in their candidates. Second, your answer may reveal a bit about your approach to your craft. That’s why it’s important to be sure and answer the latter half of this question—the “why.” Doing so reveals to your panel what you value in a good data scientist, which is likely a reflection of how you operate within your field. 6.) What do you think makes a good leader? 7.) What’s your favorite part of your current job? Hint: don’t say the free food. Treat your response here like you’re running for president: it should be diplomatic, and whether truthful or not, it should at least feign sincerity. You obviously don’t want to pump up your current job too much, or your panel might start wondering whether you really want to leave. But, you also don’t want to make the mistake of bad-mouthing your current job either. 8.) How would your colleagues explain your role within the team? 9.) Give an example of a time you’ve encountered selection bias and explain how you avoided it. 10.) In your opinion, how does data science differ from data analytics and machine learning? Though data scientists often get lumped in with these two fields, your role is—in theory—considerably different. Separating data scientists from data analysts all comes down to application. Scientists are responsible for slicing data to extract valuable insights that a data analyst can then apply to real-world business scenarios. Both roles are behind the scenes, but data scientists generally have more technical coding knowledge and don’t need to have the intricate understanding of the business required of data analysts. As far as machine learning goes: machine learning is just one small application of the work done by data scientists. Machine learning deals with algorithms specifically built for machines—data science is multidisciplinary. 11.) How would you describe data science to a business executive? Part of data science is being able to translate your findings into insights that can be understood by cross-functional partners with no technical expertise. In an interview setting, this type of question tests your ability to break free from role-specific lingo and make what you do relatable to someone who may have no understanding of data science or its value to the company. You may see alternatives of this question that ask you to describe a more specific aspect or concept of data science, but the same general principle applies: dumb it down and make it universally applicable. 12.) Describe who data cleansing is so critical and the methods you use to maintain clean data. Bad (aka “dirty”) data leads to incorrect insights which can hurt an organization. For example, if you’re putting together a targeted marketing campaign and your data incorrectly tells you that a certain product will be in-demand with your target audience, the campaign will fail, and you’ll hurt your brand’s reputation. A good data scientist conducts continuous data health checks and creates standardization procedures to maintain high-quality data. Interviewing for data science jobs? Be prepared! Enter your information below for instant access to some common technical questions. This can often feel like the most intimidating part of your interview but here’s the truth: either you know the answers to the technical questions, or you don’t. That’s the reason we’re not giving you any of the answers here—see what you know and study up to prepare for what you missed. 13.) What is a recommender system? 14.) What is linear regression? What are some better alternatives? 15.) What are confounding variables? 16.) What is the difference between Cluster and Systematic Sampling? 17.) Predictive power or interpretability of a model: which is more important? Why? 18.) What are the benefits of R language in data science? 20.) What is the difference between a compiled computer language and an interpreted computer language? Even if you think you know everything there is to know, it doesn’t hurt to brush up on some basic concepts with a friend. You might be surprised how many basics come across in a panel interview, and if you’ve been in data science for a while, you might need to dust off some of your knowledge. At Paysa, we know how tough it can be to properly prepare for a data science interview, which is why we hope this guide acts as a huge help for you throughout your interview process. The demand for data scientists isn’t going anywhere fast, so reviewing this guide regularly is a great idea for developing data scientists. 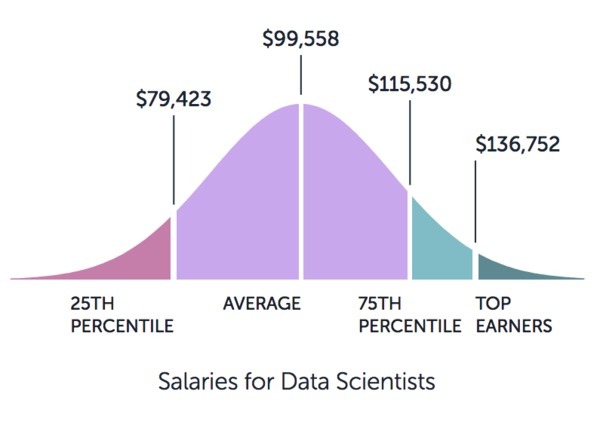 Next ArticleWhere Data Scientists Earn the Most?